The determination of human affairs by a universal reason is the normative position of liberal humanists, while the Marxists, looking at the real world of facts, find that human affairs are determined by the forces nested in power structures specific to social situations. This leads to a paradox. Political thinkers conceptualize political entities like state, nation and class in their ideal-typical forms. The legislator translates these ideal types into constitutional law and embodies them into the structure of political institutions so that all the empirical types of these entities enjoy juridical equality and possess equal rights before the law. When these types, though different and unequal among themselves, claim equal rights in pursuit of self-interest in domestic politics or international relations, there opens up a gap between the theory and reality of these entities. This gap fuels an irrational drive for power, a la Nietzsche and Freud. 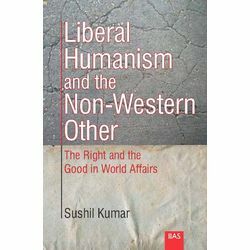 In short, the book problematizes the Enlightenment optimism based on a priori principles that an outward and upward march of reason brings home the common good.